Revel in the new Evolution of gaming PCs! The "Evolution Envy Duo" is part of our new Evolution Pro Gaming PC Range. A compact, yet stunning and powerful gaming PC, the "Envy Duo" is based on the very latest cutting edge 6th Generation Intel Skylake architecture and up to a huge 16GB of DDR4 RAM, delivering blindingly quick multitasking performance. The faster, the better! Gaming is all about speed and with the Evolution range you can almost taste the speed! Choose from a selection of rapid solid state drives, traditional mechanical hard drives or, for the best of both worlds, a solid state hybrid drive. The Evolution Envy systems come equipped with the latest Nvidia GeForce hardware and GeForce Experience software. Nvidia's latest Maxwell architecture offers massive gaming power with incredible power efficiency and low heat output. Your system will come with GeForce Experience pre-installed for easy configuration and will be compatible with the latest G-Sync monitors for smooth, tear free gaming. Prepare yourself for the next generation with the Evolution range. Windows 10 Ready and as future proof as it's possible to be the cutting edge performance provided by the latest hardware and the OcUK upgrade service, the Evolution range is the perfect companion to the gamer who is salivating over the prospect of Fallout 4, Star Wars: Battlefront and Doom. 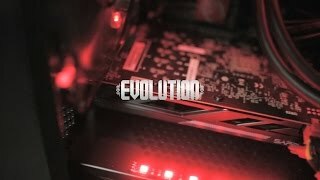 More links for ""Evolution Envy Duo S" Intel Core i7 6700K @ 4.6GHz Nvidia GeForce SLI Gaming PC"
Got this machine with the last week with the ram upgrade and the the 980ti in it after 10 years out of the PC scene. What a return! This machine does everything. I'm a software developer and a remote worker most of the time. The other day I had the base windows 10 os running a windows 10 vm, a ubuntu server vm and a ubuntu desktop vm running processing a massive csv and it didn't even stutter! When it comes to games, you just bang them up to ultra and hold onto your socks!